Today, 40 years ago in 1968, Apollo 8 orbited the Moon, taking the famous Earthrise photograph. This mission was incredibly important for manned space exploration as it's the first mission to completely escape earth's gravity and orbit another celestial body. The mission's crew was Commander Frank Borman, and pilots James Lovell (who was later the commander of Apollo 13) and William Anders. They were also the first humans to see the far side of the moon. NASA has awarded a pair of contracts worth $3.5 billion through 2016 to two private aerospace firms seeking to haul vital supplies to and from the international space station, the space agency announced late Tuesday. The Hawthorne, Calif.-based firm Space Exploration Technologies (SpaceX) and Orbital Sciences Corp., of Dulles, Va., beat a third competitor for NASA's Commercial Resupply Services contracts with their proposals to privately develop and launch spacecraft capable of delivering cargo to the space station and returning supplies back to Earth. This is really interesting, and I suspect that we'll see more of it in the near future as NASA plans on grounding the Shuttle Fleet in 2010. Commercial space programs are coming! I see this as important because I believe that the future of space exploration will be firmly rooted in commercial enterprise, not as much with public institutions, such as through NASA, although they're certainly to play a role in the coming decades. Commercial interests will be able to take the necessary risks that NASA's unable to do, and because of that, we will be able to leap into space again. 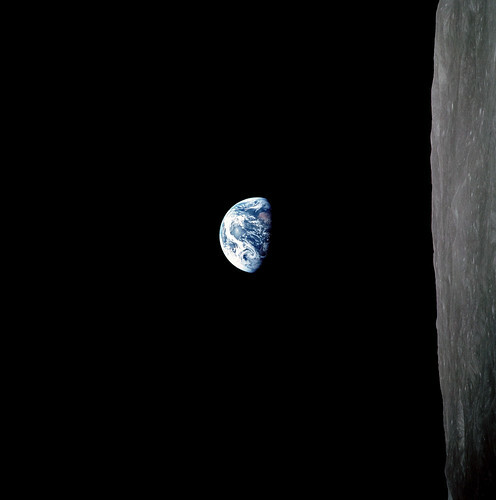 It's interesting that our first huge trip into space with Apollo 8 on Christmas eve, given its significance with many of the world's religions, and somewhat ironic. I'm not a religious person by any means, but the implications of leaving a world that many consider to have been created by divine hands is huge, and opens up huge questions, theories and thoughts when it comes to our place in the universe. The crew read from the first ten verses of Genesis during their broadcast, an incredibly touching and humbling thing to read, and entirely appropriate for the occasion, in my opinion. When it all comes down to it, we're very small, and alone in the universe. Merry Christmas to all of you on the good earth.